It’s lonely being Ted Cruz, a middle-aged vampire sent to vacation Bible school and then the deep-discount rack at Men’s Wearhouse in quick succession. But today is an exciting day for Cruz, who today has made his second true friend. 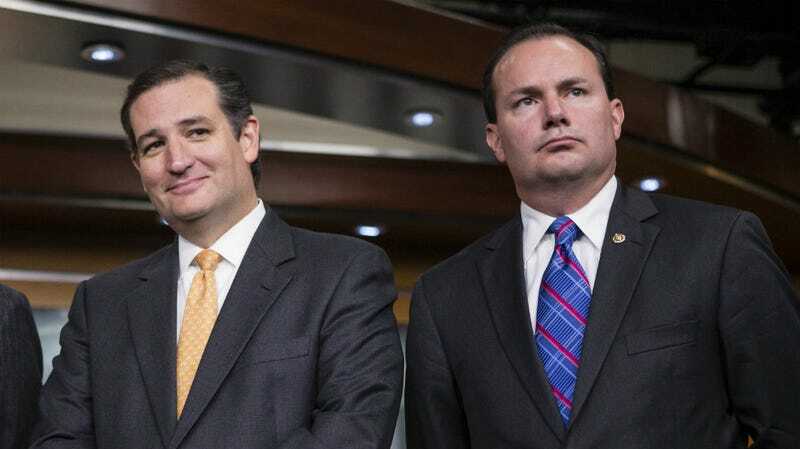 Everyone say hi to Ted’s new friend, Utah Senator Mike Lee! Actually, hang on, because this exciting new development in Ted’s life is not yet a done deal. Cruz’s original friend, you see, was David Panton, his college debate partner and the lone person who has insisted Cruz had a lively social life in college. Today, Lee will reportedly join that big empty room, the Washington Post reports, becoming Cruz’s only colleague in the Senate to endorse him. Politico has also heard that Cruz is getting ready to add a third leg to his wobbly stool of human companionship.